A vision of Tron as Santa. Are those presents in that bag!? If it’s mechanical, she can build it! That pic of Santa Tron’s been floating around the internet forever, I know. Actually, it might have been since 1999. But it’s still kinda cool to see one of the places it was first published in, right? You may remember that lab coat and glasses Tron was a design idea they had from the very beginning of her character that they finally got to utilize in Tron ni Kobun. There’s also a few nice images of Tron with the Gustaff, which was also introduced in that game. This book is actually organized into two different sections, one going left to right and another right to left. This page from Tron’s bio was page 11 from the Big Encyclopedia of Secrets side, hence 11B. This section is more focused on plot and artwork, while the other is the main guide section for the game itself. Expect to see more excerpts from this book later on! 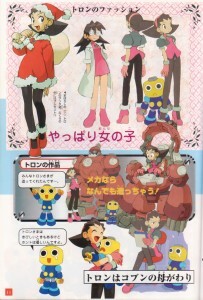 6 Comments to "Seasonal Fashion with Tron Bonne"
These are so great, thank you for putting these on your website! You’re quite welcome, and thanks for reading my blog, fellow kobun! I love the bright colors. And your kids are darling. The idea of the foam core boards is fabulous. I hope i can get some photos done soon so I can try those out. I do have to ask. I came to this via a link which linked, itself, to your 2008 predictions…Given not a single one of those was correct, why on Earth do you believe that you’re correct this time?As a non-American, I find the panic over a centrist politician who would be considered moderately right wing in pretty much any European Country including the UK, to be more than a little… well… odd. « Carddas Countdown Celebration Complete! !